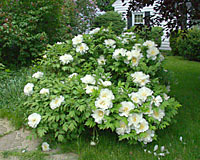 Terry L. Ettinger Horticulture Consulting Services - Recommended Shrubs for Central New York Landscapes and Gardens. Believe it or not, there are shrubs well-suited for Central New York landscapes other than lilacs, forsythia, spirea, mockorange, rhododendrons (at right), various evergreens and, of course, burning bush! The problem with all of the shrubs above, in my humble opinion, is that they're essentially "one hit wonders" - they're covered with flowers or have colorful fall foliage for a week to ten days and that's it! 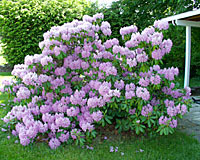 Rather, my goal is to introduce you to a wide range shrubs that offer multiple seasons of interest in Central New York landscapes. From (sometimes fragrant) spring and summer flowers, through interesting foliage textures and shapes (like that of tree peony), to colorful fall foliage and persistent winter fruit, I want to help you create a landscape filled with shrubs that respond to all of our seasons. I'll also help you find shrubs that will thrive in difficult conditions like moderately deep shade, wet soils and sites that are exposed to road salt and errant snowplow drivers! Speaking of size, please remember that many of our most common shrubs can become quite large - just like the "compact" burning bush in the picture at left (that's my Mom at right - she's about five feet, four inches tall)! So, be careful when planting shrubs next to your front door, the foundation of your home, or beneath a picture window! Otherwise, you may need to learn more about my pruning recommendations by clicking here!